This long awaited studio recording lends a clarity that allows all the elements of the music through, the stirring lithe flute, affecting vocals and often beautifully languorous backing achieved through the fusion of piano, guitar, drums and percussion. 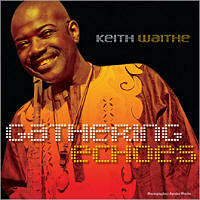 Tracks on the album draw on the writing and composition of Waithe himself, as well as that of Billie Holiday, Bob Marley, Lewis Allen and Nina Simone. Waithe’s pieces Leaf Falling Atentaben, Guyana With Love, Ska Beat and Sohani Raat leave no doubt as to the skill and beauty of his compositions infused with sensuous melodies and a deep respect for the origins they are drawn from. A number of Gathering Echoes tracks have been developed through the ongoing Strange Fruit tour, drawing on the work of Billie Holiday, including the opening piece Don’t Explain and Strange Fruit, freshly rendered through the emotive interrelationship between the flute and vocals, starkly melancholic yet warm and enthralling. From this mellow beginning springs the folk-inspired Leaf Falling Atentaben coupling lilting flute ‘vocals’ with spoken word from hip hop artist Taharka. The album continues to fluctuate seamlessly between the mellow, sensuous and celebratory with a sense of reflection displayed in Sohani Raat, Ska Beat and Here Auntie Bess.